Digging a little deeper into the history books, you can find endless writing, documentaries, films, and plays about the rise of fascism, genocide, and the fallout when a regime ends. This kind of politicking has a particular creep. Like a frog in hot water, people get used to one set of extraordinary circumstances and soon they’ve been knocked off-kilter, without a compass; the worst imaginable becomes reality. Boundaries are tested inch by inch, soon chipped away at. Inner and social lives become in a word, small. The talented veteran actor Gavin Hoffman plays the prisoner, Rick, giving him the squinty gaze that seems to come naturally to some Texas men. His hair in the popular Southern style of short on the side, with a bit of feather on the top, Rick comes off as a product of his upbringing. He’s a man who speaks with convention, at times wittily, but for the most part with an emotional wall. Andrea Vernae brings a commanding presence to Gloria, who is interviewing Rick in prison, possibly for a book. As she unloads the contents of her briefcase, she has the bearing of a woman on a long and weary mission who’s covered similar turf before. For all the burden of the world she straps on each morning, in the evening Gloria no doubt returns to a comfortable, well-appointed home priced in the midrange. Rick has seen little satisfaction in his life and would never admit to it, if he had. Gloria and Rick’s initial interactions are tense, both wanting to hold or toe the line of where their boundaries are. 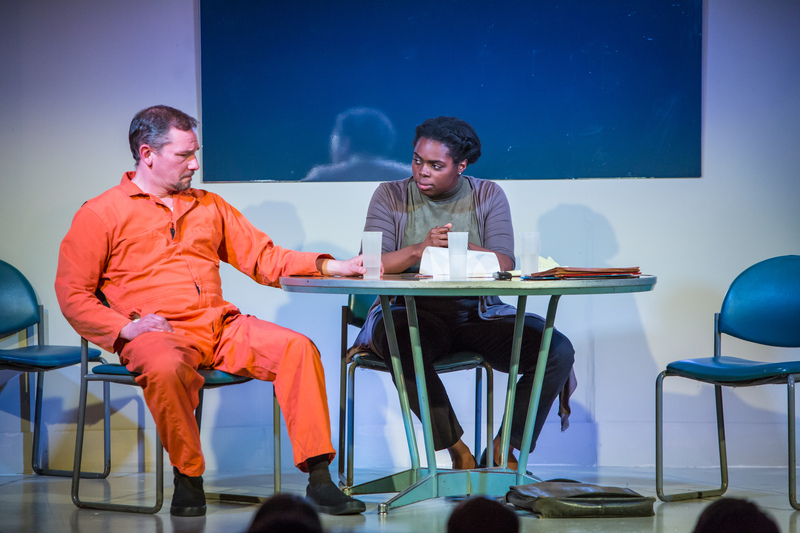 Rick is on Death Row, and Gloria is there to find out “the truth” of how he landed in solitary. She knows, like most interviewers, that he’ll dodge inconvenient truths. Rick knows how quick words can be mishandled by people with agendas. Once they agree on the terms of engagement, playwright Schenkkan’s craft rises to the surface. Schenkkan, who is also the author of, among other plays and screenplays, The Kentucky Cycle, the acclaimed LBJ plays All the Way and The Great Society (both of which premiered at the Oregon Shakespeare Festival), and the religious-cult play Handler, has deep experience in a dramatic-documentary approach. He wrote Building the Wall, he says, in “a white heat,” and it’s been having what he calls a “rolling premiere” at theaters large and small across the United States and overseas – 43, at last count. Sitting in an inner Portland theater, most bets are that the audience is there to support a sussing-out of how xenophobia is going to reveal itself in our times. The monuments around which the play is built are Trump’s promise to build a wall on the southern border, the recent legal immigration ban, and the increase of ICE arrests around the country. Schenkkan takes this fertile ground and transposes it with events from the Holocaust. The ambulances used to soothe the fears of Jews transported to death camps are blown up into an empty lingering airplane that never takes off. Rick is a kind of Adolph Eichmann, one of the architects of the Holocaust, who at his famous trial used a common defense by most high-ranking Nazi officers: He was “just doing his job.” Gloria is like Hannah Arendt, the philosopher/professor who wrote about Eichmann’s trial, had Arendt been able to sit face to face with SS brass. Schenkkan gives most of his lines to Rick, and the Pulitzer Prize-winning author’s ability to charm with a dry Texan colloquialism is handled with precision and authentic care in Hoffman’s hands. The dynamic between Vernae and Hoffman is like two pieces of flint that strike and throw off sparks when the right edges touch. The play has two halves, one of recent history and a second of possible near-future fiction. Both characters embody different kinds of stubbornness, acquainted with but struggling against each other. It’s the necessary abrasion that leads to peeling off the scabs of denial and exposes the rawness of first confession. The most interesting places to perform Building the Wall would be in pockets of Trump’s America, in the dispossessed and poverty-stricken regions where the industrial and local farming ages have died. Schenkkan’s writing and Triangle’s production have more than one dimension, and even the most savvy of political thinkers will appreciate the subtle vantage points Building the Wall exposes and welds together. Building the Wall continues through April 29 in Triangle’s home space, The Sanctuary at Sandy Plaza. Ticket and schedule information here.